Manufacturer of a wide range of products which include 20 ton capacity frp 900 dia manhole cover. 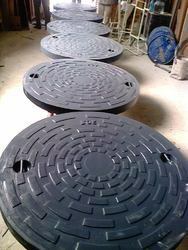 We are offering Manhole Cover in India in cast iron, ductile iron, steel fibre reinforced concrete, RCC etc. Now we have developed ever lasting composite FRP manhole covers, frames & FRP gratings, which are being used in India continent. Owing to our superior quality products and excellent services, we have been able to create a strong client base, which includes reputed builders and contractors in Government and Private Sector.